Possible alternative title for this post: You need three before it counts as a collection, right? 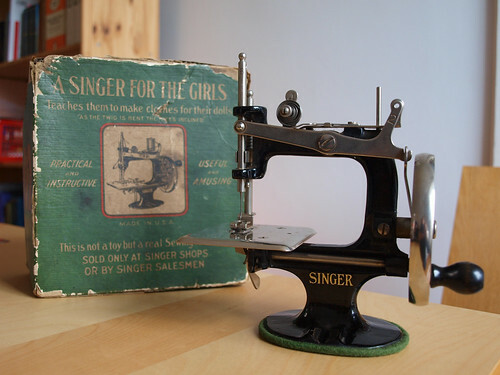 It is another Singer, this time the hand-cranked No. 20. 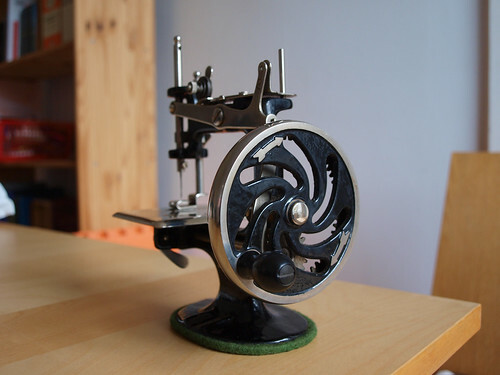 It is probably not clear in the pictures but it’s only about 6″ high since it was designed a child’s machine. 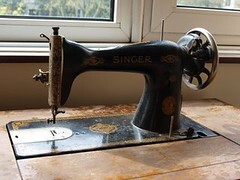 Like my first vintage machine, it was in pretty good condition when I bought it and just needs a little bit of oil and cleaning. … and the arrows to show you which direction to turn the hand-wheel. 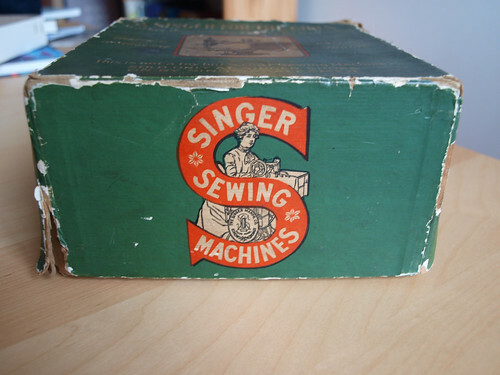 Unfortunately, these machines don’t have serial numbers so they’re not quite as easy to date as the full-size Singers. 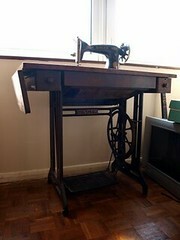 A little bit of internet research leads me to believe that this machine was probably made some time after 1926 and before the 1950’s so from the same time period as my treadle machine. 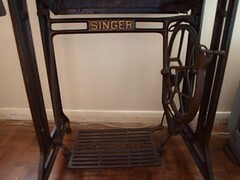 The caption above the picture on the front says “As the twig is bent, so the tree is inclined.” The machine itself is described as being both “Practical and instructive” and “Useful and amusing”. I certainly hope so! 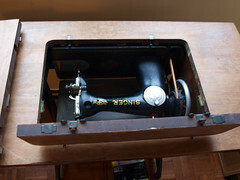 Someone asked for details of whether or not my vintage Singer machine folds into itself so I thought I’d take some quick photos to show how it works. 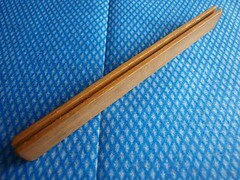 The “extra” bit of wood in the picture below usually attaches to the left-hand side of the table when not in use. 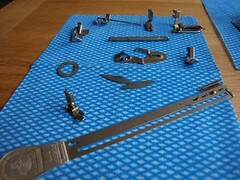 Otherwise the picture shows the machine set up for use. 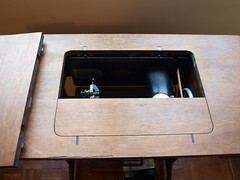 The machine tips back slightly so that the piece of table-top in front can be lifted. With that out of the way that machine swings right down into the body of the table. 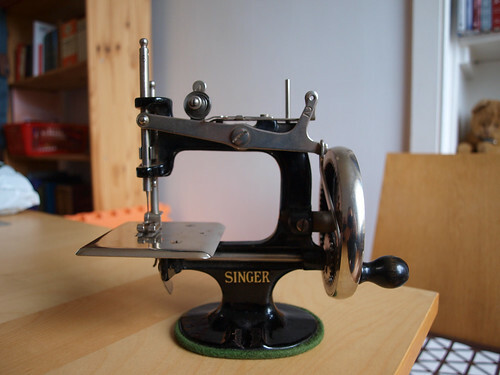 With the machine inside, the first piece of the top can be replaced. 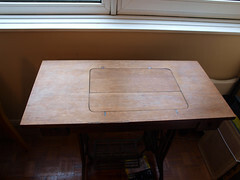 Then the “extra” bit fits into the remaining space to complete the table-top. I’m slightly ashamed to admit that this is how the machine currently spends most of its time. 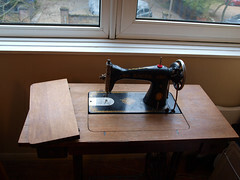 I did get a quick lesson in how to use the treadle last time my mum visited so I just need to find the time to practise. 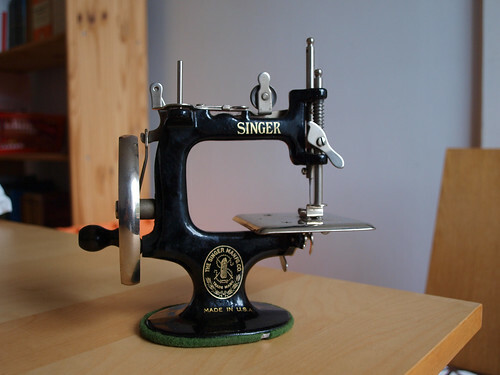 As a child, I loved rooting through my mum’s sewing basket trying to work out what all the different bits and pieces were and how they were used. No matter how much time I spent looking through that basket, there always seemed to be something that I hadn’t seen before. 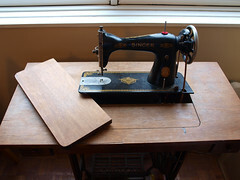 That’s why when the salesman in the junk shop showed me that the sewing machine table drawers were filled with attachments for the machine and other craft-related paraphernalia I knew I had to buy it. 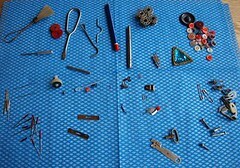 I’ve already talked about the sewing machine parts but here are some of my other favourite bits. 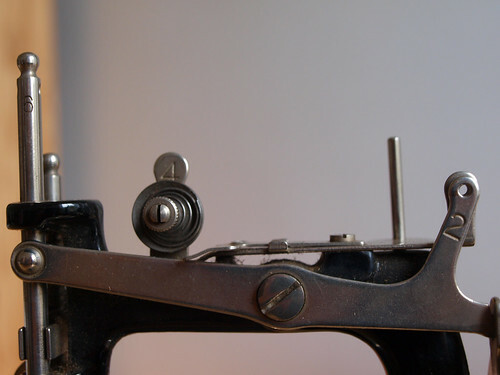 A Turkey Rug Wool gauge — used for cutting lengths of wool to the right size for rug-making. 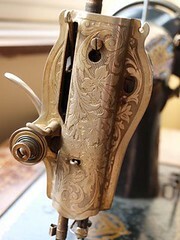 You wind the wool round and round the gauge and then your scissors or knife slide down the groove to cut the lengths. I’ve never tried rug-making so I’ve no idea what you do after that! 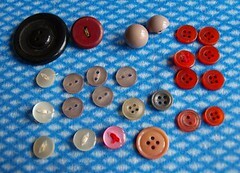 Buttons — none that are particularly exciting but you can never have too many buttons! 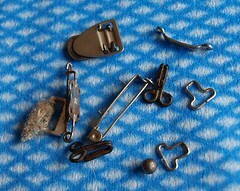 Hooks, clasps and pins — I love that some of these (and some of the buttons) have small pieces of fabric attached, showing that they’ve been saved from old clothing. 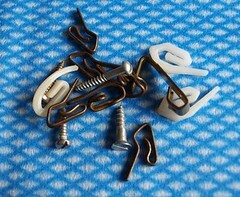 Screws, picture hooks and curtain hooks — It’s always reassuring to see that other people end up with weird collections of DIY oddments in their craft stuff. 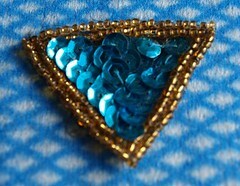 Blue sequinned triangle — part of a fancy dress costume, perhaps?